Every white light has its own hue, or color temperature (CT) that falls somewhere along a red to blue spectrum. On one end, red spectrum light creates a relaxing, cozy feeling, like candlelight or incandescent lights. On the other end, blue spectrum light is energizing and uplifting, like a blue sky. Color temperature creates ambiance, affects people’s moods, and can change the way our eyes perceive details. Light at the low end of the Kelvin scale has a very warm (red) hue. Light takes on a cooler (bluer) hue as you move up the scale. DLC’s products typically range from 3000 K (warm candlelight) to 6300 K (blue sky). LED chips are intrinsically blue, red, or green. Blue LED chips are selected for white LED lights, then coated with yellow phosphor to attain a particular color temperature. This yellow phosphor coating happens in batches. Different batches, by nature, have differences from each other. To minimize differences across the LEDs in our products, DLC uses a tight ANSI Bin control system. This effort helps us keep our color temperatures consistent. Note that LED phosphor coatings can quickly degrade if a light’s heat is not managed. This is an issue for some competitor LED panels. If degradation happens, some LEDs will revert towards their bluer tone and the light can take on an uneven look. Read more here about how LumiSheet’s heat sink technology manages heat to maintain your specified color temperature. Color temperature is a powerful part of design strategy. For this reason, it’s best to determine color temperature after looking at a number of factors to make sure it integrates nicely into your space. Luckily, there are ample color temperature options to help your lighting fit your space’s purpose. Consider these starter points when specifying color temperature for our top application categories. Architectural lighting needs to adapt to designers’ creative visions. For this reason, DLC has wide range of products that can be ordered in any color temperature you need, including variable white. This includes LED light panels in any shape, size, and curve (that’s right, we have curved panels), as well as LED light bars, LED light channels, and more. Elevator spaces are tight, which means people are close to lights. Therefore, comfortable, glare-free lighting is a high priority in elevator cab design. Softly diffused lighting in the right color temperature will help create a relaxing experience for occupants. Further, occupants can find the experience of getting onto a suddenly bright or dim cab jarring. Designers can create a seamless lighting experience for occupants by matching elevator lighting color temperatures with the space outside the cab. Also, lighting may also be tuned to suit natural light outside as the day progresses. Healthcare spaces are often blocked off from sunlight. However, the daylight cycle helps patients heal and technicians stay focused. For example, light from the sun tells us when to wake up in the morning, helps us stay motivated all day, and cues us to wind down at night. Enter Human Centric Lighting. This is lighting that is designed to help people see, feel, and perform better. DLC’s variable white products can be scheduled to provide the same lighting indoors as can be experienced outdoors to help regulate patients. Human centric lighting can also help night shift technicians experience the energy boost we naturally get from mid-day sunlight. The perfect color temperature for a retailer is the one that best fits the brand’s strategy. Color temperature in retail enhances brand experience, sets a mood for customers, and shows products properly. Most of our retail orders of LED light panels and LED light sticks are in cool color temperatures. This is because cool light, especially when ordered in high CRI, shows products crisply and helps the eye see how the item moves. Further, cool light resembles the sunlight that energizes us in the afternoon, so it has the added benefit of giving customers a boost of motivation. While cool tones are popular, many lighting designers also specify our LED products in neutral and warm color temperatures. They do this after analyzing what brand needs from its lighting. Warm lighting may be chosen to suit a brand’s style and to create a more relaxed vibe. Recently, many retailers have started to specify variable white lighting to create a wide range of possibilities in their stores. 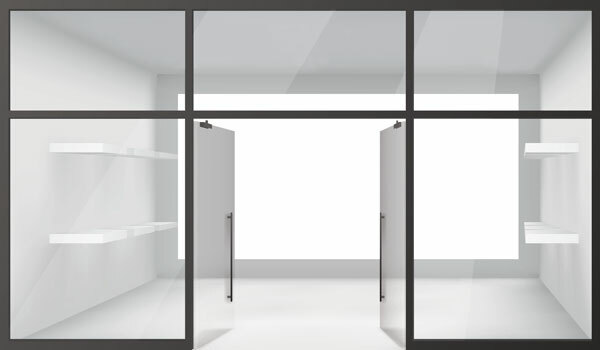 With variable white, retailers can adjust the lighting of a store to suit the time of day or any other factor they choose. Further, with our Omni Control Touch LED Controller for Mirrors, customers themselves can adjust the color temperature of their environment when trying on products. Read more: Fitting Room Lighting: Are Most Retailers Getting it Right? Typically, our customers will choose a pure white (5300 K) to backlight their graphics, with good reason. Pure white backlights do not add any warm or cool tones to the lit graphics. As a result, light boxes show creative exactly as designed. However, some customers have stunning results when they choose warm or cool white for light boxes that match the space’s overall design.